Auto Panels is a family run Collision repair business with over 20 years in the industry. Andrew and Ngarita are passionate about growing the business and always aim to provide quality panel beating and painting repairs with the minimum of fuss and inconvenience. 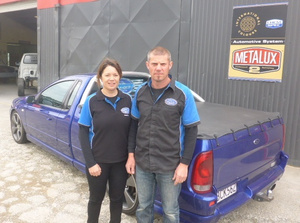 Auto Panels are members of the NZ Collision Repair Association. Auto Panels are committed to staff training and undertake regular internal and external training through I-Car NZ and Spies Hecker Waterborune. At Auto Panels there are three certified I-Car Welders, along with qualified First Aid Personnel and there is a solid Health and Safety Policy in place. Auto Panels offer a Quality Control check on every vehicle before returning it to its owner. As a company, Auto Panels takes pride in its friendly staff, and the quality workmanship that they offer. All our products and paints are top quality and we use environmentally friendly paint that is better for our staff and environment. After spending 10 years working and travelling overseas decided to come home, and take over the business from Andy’s Father. Since coming home, they soon realised their love of the Southland region. As a family, they enjoy the great outdoors, mountain biking and tramping around the area in their spare time. They have a wee boy who enjoys BMXing, sports and getting outdoors. Andy and Ngarita are hugely passionate about the car industry and the Southland region. Zane Pile, Foreman, has been with Auto Panels Waikiwi for eight years and started as an apprentice. He is recently married. He loves the great outdoors, fishing, and being a part of the gun club where he competes nationally. He is also a boxing instructor. He recently came back from spending five weeks in the USA. Auto Panels employs two qualified panel beaters, and an apprentice who together have over 70 years’ experience.. Auto Panels also employs 2 qualified Automotive refinisher, and apprentice refinisher.